MicroGaming began in 1994 when they created the world’s first true online casino. In the two decades since, the company has gone from strength to strength, especially since the launch of their Viper Software in 2002. As well as casino software they also offer poker, bingo, network gaming and live dealer casinos in their product range. The company is one of the founding members of eCogra, a leading independent and internationally accredited testing agency and helps tackle community issues with their MicroGaming Health & Care Trust. You’ll be able to play both a Flash version and a download version of the MicroGaming casino software, the company has created over 700 unique casino games. The company publishes a great mix of licensed and proprietary content and keeps their content up to date with new offerings on a monthly basis. More than 100 games have also been made available via native iOS and Android apps. The quality of a software provider can be evaluated by the number of online casinos using the particular software. The fact that over 100 online casinos use MicroGaming is a ringing endorsement of this forward thinking company. There are a variety of options when playing roulette at Microgaming casinos. The standard offering of the game is the European, French and American Roulette. These games show the wheel in the top left-hand corner of the screen and the betting area covering much of the screen. These games serve a purpose as a basic game and give you the opportunity to play different versions of roulette, however, there are far better varieties of the game at MicroGaming. The European Gold Roulette has a similar layout, but the graphics are much sharper than the standard version and the motion of the wheel is much smoother. Here you can bring up a detailed history of the previous spins and you’ll have a greater variety of betting options including call bets and announce bets. There are both standard and high limit versions of European Gold Roulette. 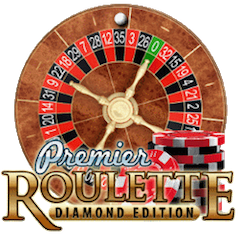 The best versions of roulette, however, are Premier Roulette and the Premier Roulette Diamond Edition. These both offer a large wheel spinning above the betting grid. Graphically, the animation of the wheel is outstanding and it’s extremely easy to follow a particular number – you’ll need no close-up of the final destination of the ball in this game. You’ll be able to customize the look of the wheel and bring up a graphical representation of the table statistics. When playing virtual roulette, you’ll not see a better version than this game – in some ways, this game is just as impressive as and easier to follow than the live casino versions of the game, without a live dealer obviously, but easier to follow on the screen. Other versions available are the multi-wheel and the multi-player games. The multi-wheel roulette gives you the chance to play up to eight tables at once, with a single bet being placed at all of the tables, costing up to eight times your stake. Multi-player roulette adds a social aspect to the game, giving the player the ability to chat to others at the table whilst playing. MicroGaming also offers a game called Spingo, which is based on roulette, featuring a numbered ball and colored slots. Here you’ll be betting on the number of the ball, the color of the slot the ball lands in or a combination of both. As well as roulette, other table games offered at MicroGaming include Baccarat, Blackjack, and Craps. All of these games offer high quality, sharp graphics. Video Poker is also well catered for with sixteen versions of the game available. However, by far the most impressive offering at MicroGaming is the wide array of slots available. With over 300 slots currently on offer and many of these offering progressive jackpots, it’s hard not to be impressed. Mega Moolah, Thunderstruck II and the Dark Knight slots are games that any slots fan should not miss. 32 Red is a top quality online casino that features the MicroGaming software. With this great array of bonuses available for players of a wide variety of games and for all bankroll sizes, there is clearly something for everyone here. 32 Red is an award-winning site, hoisting the “Best Casino of the Decade” at the prestigious CasinoMeister awards. Even better the fact that you can sign up and receive a bonus without even making a deposit – £10 available for nothing! Your first five £10 deposits can also gain you a £32 bonus each time. There is a 100% bonus specifically for roulette players and players of other table games up to £250 or a 150% bonus for slots players up to £300. For high rollers, 32 Red will match a deposit up to £1,000.